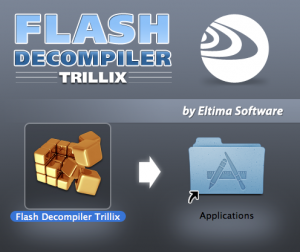 SWF Decompiler for Mac, developed by German-basedEltima Software, converts your SWF files into FLA or Flex files, and is an absolute lifesaver when it comes to restoring lost original files. Say you’ve accidentally deleted an original FLA file or Flex source file (or it had been corrupted.) Thankfully, instead of wasting hours fiddling around attempting to rescue it, you can use this handy bit of Mac software to restore your initial source in a couple of minutes. 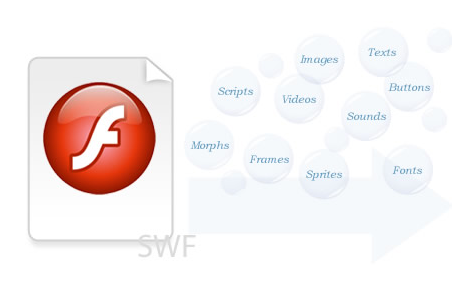 All versions of Flash, including Flash CS6, Flex and AS 3.0, are currently supported. 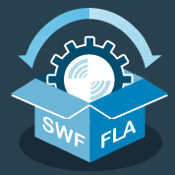 You can also use the program to extract any part of an SWF and save it as a separate file (for example, images, text, or sound bites.) And you get full control over the scripts: not only can you view, but also copy, paste and search through them. The interface is a very stripped down, no-frills kind of deal, making it very easy to navigate. Also impressive is the ease with which you can get support from Eltima. You can contact them at offices in the US and Germany by phone or mail; there’s also a whole host of IM accounts you can contact them with, which few other developers can boast. And did we mention their great How-To area? You can easily try SWF Decompiler Free Demo and preview the results immediately. 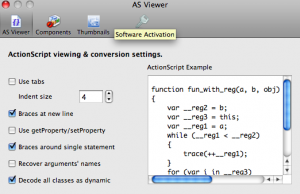 There’s also a Windows version available. But to get a full version, you will need to spend between $80 and $800 or so, depending on whether you need the program for multiple users, personal use, or business purposes. But no matter the cost, it’s absolutely worth the price to the right kind of customer. After all, there’s no easier-to-use offering out there.